CLEVELAND (AP) Before leaving the Cavaliers’ locker room, LeBron James made sure doughnuts from the team’s tasty postgame spread were packed in his bag. 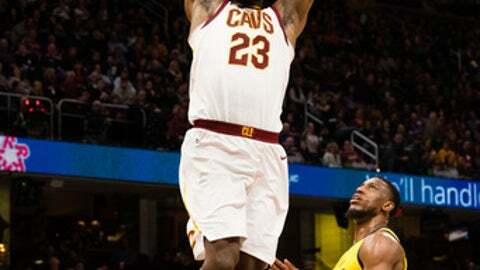 James recorded his 63rd career triple-double – overcoming a career-high 11 turnovers – and J.R. Smith scored 23 points as Cleveland showed some signs of ending its stunning slump with a 115-108 victory over the Indiana Pacers on Friday night. James finished with 26 points, 11 assists and 10 rebounds as the Cavs, following a minor lineup switch by coach Tyronn Lue, won for just the fourth time in 11 games. However, James kept Indiana close in the fourth quarter with six turnovers – most of them coming on errant passes. With the highest turnover total by an NBA player this season, he joined James Harden and Russell Westbrook as the only players with a quadruple-double in the last 15 years. It was sometimes ugly, but it was a much-needed win for the Cavs, who beyond losing have been bickering and backbiting each other. Earlier this week, Cleveland’s players challenged each other during a heated team meeting. There are still problems to be worked out on the floor, but at least for one night there was mostly harmony. Still, there were a few curious moments. At one point in the first quarter, Kevin Love grabbed one of his 13 rebounds and turned and bent down to hand it to 5-foot-9 guard Isaiah Thomas, who left Quicken Loans Arena before the locker room was opened to media members. Also, during a timeout, Love tossed his hoodie in the face of teammate Jeff Green, who didn’t look pleased. Following the game, Green playfully returned to the locker room to challenge Love, who said it was all done in fun. Smith made seven 3-pointers and Derrick Rose scored 14 points for the Cavs. Cleveland was without Dwyane Wade, who was excused from the team to attend to a personal matter. With the Cavs unable to snap out of their prolonged, puzzling slide, Lue returned to a proven starting lineup with Thomas joining James, Love, Tristan Thompson and Smith – the latter four starters that led Cleveland to three straight NBA Finals. The new/old look paid off and Rose came up big, scoring seven straight points in the third when Lue pulled an ineffective Thomas. Rose recently returned after missing two months with ankle injuries that had him considering whether to continue playing. Smith has been in a miserable shooting funk, but found his stroke. One of the NBA’s best – and least shy – outside shooters, Smith came in shooting just 5 of 31 from long range in his previous five games. Oladipo said the Pacers weren’t thinking about sweeping the Cavs. Pacers: Surrendered a season-high 73 points in the first half. … F/C Myles Turner (right elbow) missed his ninth straight game. ”He’s practicing but he’s just not ready,” said coach Nate McMillan. … Collison returned after missing Wednesday’s game against Phoenix because of a personal reason.